Merge two PST files in Outlook. Free PST merge tool - merge two Outlook files. Easily merge two archive PST files in Outlook. Microsoft Outlook users are frequently looking for a solution to merge two Outlook files, due to occurring difficulties to manage their data within multiple archive PST files. All important Outlook information might be saved between multiple PST files on different Outlook accounts or even on different computers. Therefore, it takes too much time and effort to search for some particular information across separate PST files. The best way to avoid such inconvenience, while dealing with different data files, is to merge two Outlook PST files into one, which can be opened with Microsoft Outlook or free PST viewer. If you are looking for a free tool to simply merge two Outlook files, PST Merger is what you need. It is an efficient and easy-to-use software tool, which allows you to combine two PST files data in a few clicks. With this free PST merge tool, you will surely improve your work with daily Outlook tasks. No need to waste time while managing plenty of Outlook files. Join PST files by using the PST merging software and get the best result. In order to get the full advantage of the software, use the PST Merger Pro Edition. It allows you to choose additional options if you need to merge, move or copy PST files. Select the most suitable scenario to join PST files. With the Pro Edition, you will be able to access all available features, including the ability to choose particular PST file folders or unlimited PST files to merge, and store the new PST file in a specified location. Purchase the Pro Edition by clicking on this link, and get full access to these advantages. How to merge PST files? PST Merger is user-friendly freeware that allows you to merge two archive PST files and organize your Outlook data in a couple of clicks. It has a simple and clear user interface, which makes it easy to get started. Using the Free Edition of PST Merger, you can only combine two Outlook pst files into a single one, with automatically defined PST file destination. Just simply choose the “Merge several files into new file“ option from the PST Merger Wizard. 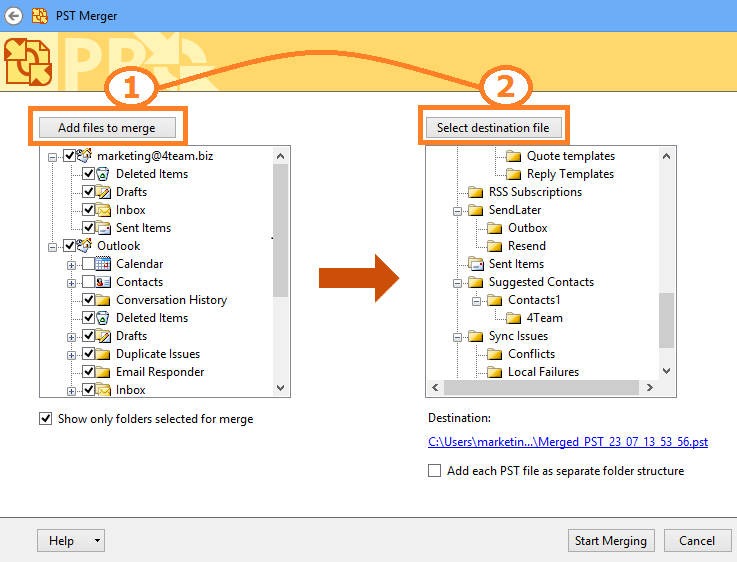 In the second step, pick the PST files to merge and click “Start Merging“. The Free Edition will allow to merge two PST files only. However, if you need to merge more than two PST files or get additional options to specify particular folders to merge, get the PST Merger Pro Edition. 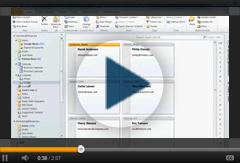 It offers a number of advantages to combine Outlook PST files data in the most convenient way. Besides merging, you can also choose other two options of data transfer, when your data from several PST files can be moved or copied to one PST file. By clicking the “Move content from several files to selected file“ option, the specified PST file data will be moved to the specified PST file, which makes the data no longer accessible in the primary PST file. In case the “Copy content from several files to selected file“ option is chosen, the data will be copied to the specified PST file, without making any changes and retaining all the data in the PST file from which the data was copied. Thus, the Pro Edition offers different scenarios with additional filters and options, in order to join PST files data in the most suitable way. Click here to read more about the PST Merger Pro Edition.